and share quality time. It also aids language development by introducing the natural sounds and patterns of speech. Combining these with actions stimulates the brain and helps muscle development and coordination. When saying or singing rhymes, adults speak more softly and slowly, making it easier for the baby to understand, and the rhythm is a source of comfort. Actions in rhymes add an element of surprise, fun and laughter - ensuring an enjoyable shared experience. Babies discover the essence of communication through movement and musicality. Babies and children who 'learn' nursery rhymes and songs develop an understanding of turn taking and joining in, which is essential for communication and dialogue. They also do better when learning to read and write as they already have an understanding of how language works. As well as actions and finger rhymes developing fine motor coordination, they also help the child develop body awareness. Repeating rhymes will also aid the development of sequential memory. To get you started you might like to attend a Bookstart Rhymetime sessions. Sessions are organised locally and take place in children's nurseries and libraries. They incorporate a mix of songs, rhymes, rhythm and movement, and provide the opportunity to share games, novelty books and toys. 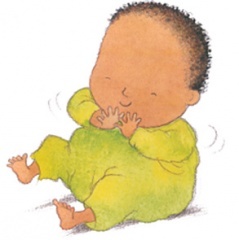 To find your local Rhymetime session, visit the Bookstart website.